On ABC, Channel 10, Sunday nights, just before 9, for the merest of seconds the words HOOSICK FALLS, with a background of film strips, fill the television screen. It’s a kick! The person who probably gets the biggest kick out of it is George Verschoor. He is the producer of Extreme Makeover Home Edition and his company is Hoosick Falls Productions. Thus, at the end of each Extreme Makeover show, there it is – Hoosick Falls, big as life on the TV screen. He said he often is asked what Hoosick Falls means and where are the falls. 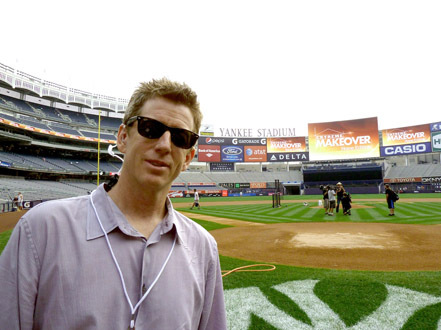 George Verschoor in Yankee Stadium where Extreme Makeover Home Edition surprised a family by sending them on vacation and building them a house in a week. Photo courtesy of Hoosick Falls Production. Verschoor has always had a love for film. His dad worked in television in New York. Being a producer was always his dream. He studied film and television at Syracuse. Then in 1983, with a few hundred dollars he had earned at Delurey Sales & Service, he moved to Los Angeles. He slowly worked his way up the ladder. His major break came in ’91 when he started working on The Real World on MTV. That show is still going on. Then he created and was executive producer of Nashville Star, a Country music star search show. “One of our discoveries was Miranda Lambert who won the Country Music Top Female Vocalist of the Year this year,” he said. Production time varies from four to seven months per house. There will be six more episodes this year. Then there are the special problems. The Christmas show, for example was a house built in Pensacola, FL. It was quite warm, and they needed to use a snow machine for that winter quality. They threw a wedding for a show scheduled to air in January or February. “It was really nice,” said Verschoor. That house was built for a soldier wounded during the shooting at Ft. Hood, TX. Of course, one of the perks is having your friends appear on a show. Verschoor said John Delurey was in one and while they were filming in Lovett, TX, Mary (Loretan) Jackson and her family came to visit and they should be visible in that episode. Thanks, George! You’re doing good work. Having noticed for some time the brief reference to Hoosick Falls at the end of Extreme Makeover each week, I am so glad to now know the story behind it. This is wonderful because it brings together my favorite TV program with one of my favorite places on earth, the wonderful hometown for two of my favorite people on earth, granddaughters Ayla and Paige Graney.